This coming Sunday, November 24, is the much awaited fight between Manny Pacquiao and Brandon Rios at Macau. 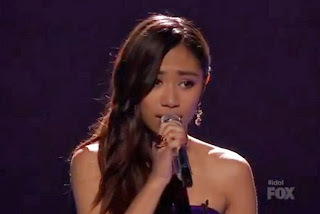 American Idol runner-up Jessica Sanchez confirms singing at Pacquiao-Rios fight. Through social media site Twitter, Sanchez re-tweeted Manny's tweet asking if she want to do singing our national anthems before the fight. Last year, on Pacquiao-Bradley Jr. fight, Jessica Sanchez sung American national anthem, and in that match, Pacquiao lost his fight on controversial decision. For the meantime, please bookmark this page now or visit this site more often for you to be updated. You may also share this post to your friends so they may know about Jessica Sanchez who will sing national anthems on November 24. Comments or suggestions about "Jessica Sanchez will sing national anthems on Pacquiao-Rios fight" is important to us, you may share it by using the comment box below.